With a tough Limburg course making it all but impossible for him to repeat his victory of last season, Mark Cavendish has said that he wants to savour his remaining days in the rainbow jersey, even if it means missing out on leading the Tour of Britain. The sprinter took yesterday’s stage win, winning into Dumfries for the second consecutive year. That put him level on time with race leader Leigh Howard, yet he reacted surprisingly when asked if he would push hard to reach the top of the leaderboard. His answer in the TV interview minutes after he crossed the line was one of near-surprise, with the Manxman saying that he didn’t see the need to change the jersey he was wearing. He elaborated on that later, saying that being seen as the world champion is more important to him than being the race leader. “I thought about coming here for the overall [win], to try and wear the gold jersey,” he said, “but I kind of want to wear this for as many days as possible before next week. It’s actually dawning on me now that it’s actually been a year and I am trying to savour the moment. The race gets tougher from this point and while today’s stage could end in a bunch gallop, the remaining days are harder and should shake things up. 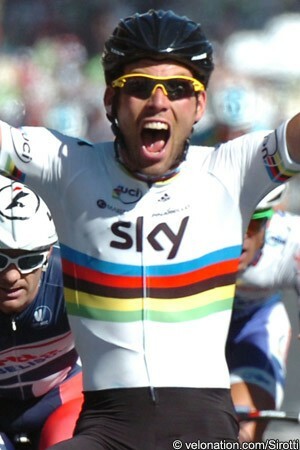 Cavendish perhaps realises that he’d be under a lot of pressure to control the climbers on the category one climbs ahead, but it’s also clear that he takes a lot of pride in wearing the rainbow bands. It ensures that he has the perfect send off prior to lining out in the road race championships later this month. In the meantime, Team Sky has a race it wants to win. With Cavendish appearing to rule himself out, he suggests the rider who triumphed on stage one could be the one for the team to put its weight behind. “Luke Rowe is such a good bike rider, you know. He could win the overall,” he said. Rowe is currently fourth overall, four seconds behind Howard and Cavendish. Victory on today’s stage would put him into the race lead and with Cavendish claiming he wants to keep the rainbow bands, the world champion could well lead out his team-mate if both are present at the finish. Today’s fourth stage of the race covers 156 kilometres from Carlisle to Blackpool, linking those start and finish towns for the first time since Roger Hammond beat Rob Sharman and Cavendish to the line in 2005. Today’s route scales category two Skoda climbs after 51.8 and 79.9 kilometres, then later crosses the third category Quernmore climb inside the final hour of racing. IG Sigma Sport pro Dan Lloyd will be one of those in the peloton, and rode the route beforehand in order to preview the stage. He assesses some key points in the video below.